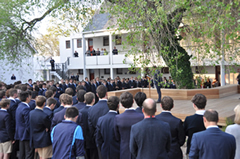 Bishops boasts a newly renovated and updated resource centre that provides boys and staff with an academic and cultural hub in the heart of the school grounds. 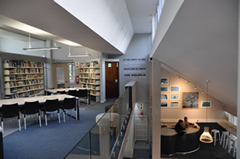 Known still as The Molteno Library, the centre provides digital, written and social resources to expand and enhance learning beyond the classroom and the curriculum. The new entrance opens up the library into the History and English quad, just behind the Memorial Chapel. This not only connects the library to natural space and lighting, but also positions it as a focal point within the Academic precinct of the school. The original HA Molteno Library was designed by Maciek Miszewski and opened in 1977, before which the library had been housed in the Brooke Chapel. 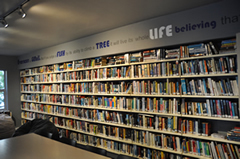 By 2013, however, not only was the library in need of a renovation, but the role of the school library at Bishops in the 21st century had to be reconsidered. With the help of others, Mr Gerry Noel (who was the Molteno Resource Coordinator at the time) researched academic resource centres and libraries around the world to reach the conclusion that 21st century libraries are no longer quiet places in which to read and work, but are also places of activity and action – they are not so much about collections of books, computers and resources, but about connections of people to other people, aided by a range of different resources. 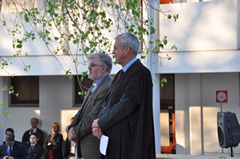 As a result, the Molteno Library has been carefully designed and renovated to provide the most appropriate spaces for the evolutionary change in learning and teaching, which has become much more of a collaborative effort aided by digital resources. 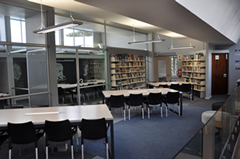 With the input of many others, Gerry Noel worked with Ms Jane Baldwin (the architectural designer) to create a modern, super-charged wireless, multi-functional centre that offers flexible learning spaces able to accommodate over 180 users at a time. 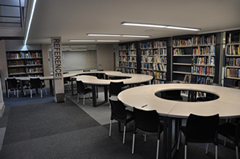 The physical size of the library has not changed, however the spaces have been dramatically reconfigured to create the best learning and collaborative environments. 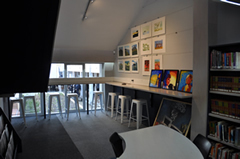 The Social and Research Commons is based on the ground floor and is a space for boys to connect, both inside and out. 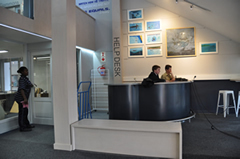 It houses the issue desk which is manned by the library monitors at break times, as well as comfortable furniture, non-fiction books, magazines and newspapers. It has internet-café style seating with stools, as well as flexible desks with plug points for laptops. This area also has a 24-hour access print room attached to it. One level up is the Learning Commons, which has an open area - with tables and chairs - that is large enough for a class, and wall-shelves that house the many Art and History books. It also has three sound-proof glassed seminar rooms with state-of-the-art projectors and sound facilities. 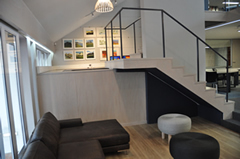 Within these rooms, boys can (at last) legitimately write on the walls painted with IdeaPaint. 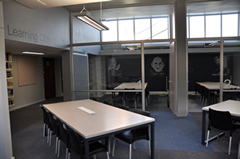 These seminar rooms are used a great deal by the boys for collaborative work and studying. 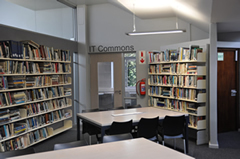 The IT Commons is also on the second level and provides an open working area for the ICT staff who offer support and advice to teachers on integrating technology into the curriculum and software assistance to boys. At the back of the same level is the Reading Commons, a quiet closed-off space that houses the fiction books and large comfy ‘fatsacs’ (big bean bags), and provides a haven to which boys can retreat to read or study. 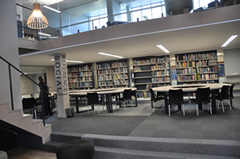 Finally, on the third and top floor of the library, is the Indaba Commons, where the platform and seating for 30 people provide a space for drama, debating, public speaking and literature readings. This, too, has a state-of-the-art IT projection facility with surround-sound, along the lines of a mini movie theatre. 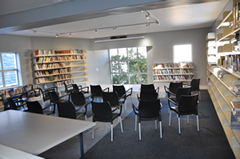 The Molteno Library is now a vital, vibrant part of the school, which can be used not only as a resource centre and teaching space, but which also provides a modern, comfortable space to host society meetings after hours, provide venues for the Eisteddfod, and accommodate staff or parent meetings. 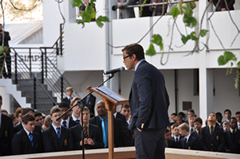 However, what has been most important in the upgrade of the library is to recreate ownership of the space by the boys themselves, building in a sense of responsibility and respect. 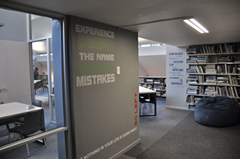 The space belongs to the boys and staff of Bishops and so they were and still are integral in shaping, creating, designing and thriving in what is now a world class 21st century library.